Tyrion Lannister in his iconic look. Action figure based on Game of Thrones Season 7. Features an amazing likeness of actor Peter Dinklage! Includes interchangeable hands, a fabric costume, and accessories. 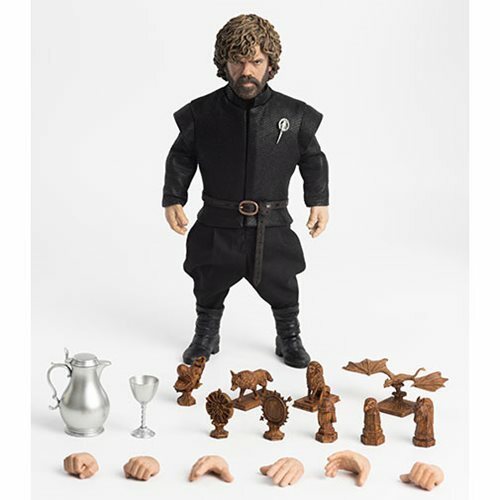 Based on Game of Thrones Season 7, the Game of Thrones Tyrion Lannister Season 7 1:6 Scale Deluxe Action Figure stands about 8 3/4-inches tall and features an amazing likeness of actor Peter Dinklage. His tailored cloth costume features a doublet vest, trousers, belt, and boots, and accessories include a Hand of the Queen brooch, 4 pairs of interchangeable hands (fist, relaxed, opened, a left hand for holding the jug, and a right hand for holding the goblet), a jug, a goblet, and 9 map markers.